The World Radio TV Handbook (WRTH) is a directory book (or CD) of world radio stations on LW, MW, SW and FM. In addition to the directory they also do reviews of radios/SDRs, and recently they reviewed the Airspy HF+ (pdf). 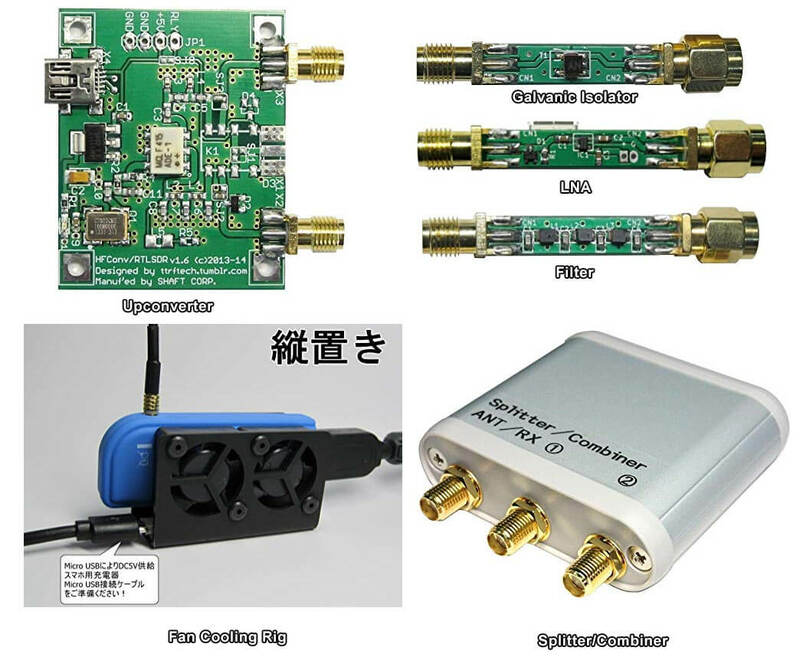 The Airspy HF+ is high dynamic range HF/VHF receiver designed for DXing. According to the review, WRTH give the Airspy HF+ the award of being the best value HF SDR for 2019. The review takes note of the HF+'s excellent dynamic range and then goes on to validate the manufacturers claimed specifications. Finally they write how they tested it during a contest at 7 MHz, and found no overloading or spurious responses apart from a minor noise floor increase when an extremely strong local CW station was encountered. Broadcast shortwave radio is not always archived for long at the station, so finding sound bites from interesting historical events can be difficult. We know that songs are of course recorded, but talk back radio, discussions in between music, news readings, weather updates, ads and pirate radio are all lost over time. Although these things may seem mundane now, future historians may be interested in listening in on this little slice of life. 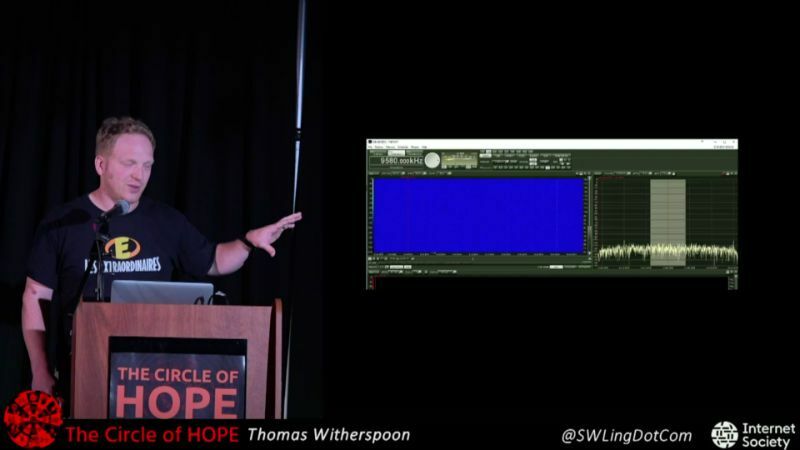 At this years HOPE XIII conference, Thomas Witherspoon, owner of the popular SWLing Blog gave a talk titled "Creating a Radio Time Machine: Software-Defined Radios and Time-Shifted Recordings". Currently the talk is available as a full recording of all talks at the conference over on Livestream. Thomas' talk begins at about 9h03m45s (thanks to Aaron Kuhn from the comments for finding the talk. Hackaday also recently ran an article on the content of his talk. Thomas' idea is to create a database of shortwave radio IQ recordings so that they can be archived for historical purposes. The project is called "The Radio Spectrum Archive" and has a website set up at spectrumarchive.org. 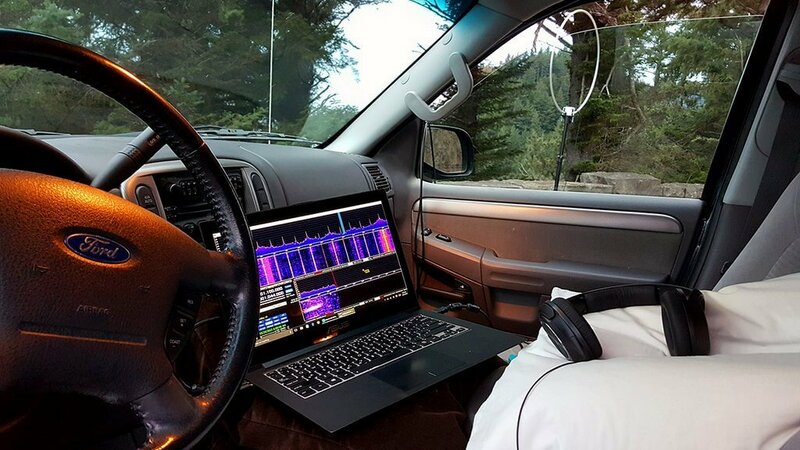 To do this modern software defined radios like the RTL-SDR can be used to record a large bandwidth, however the problem is with data storage as IQ recordings can take up extremely large amounts of disk space. Interestingly, it turns out that people have actually been making IQ recordings since the 1980's by connecting their shortwave radios to VCR tape recorders. In the modern day these VCR recordings can be digitized into an IQ file, and played back in software like HDSDR. In the video below Thomas demonstrates the playback of a digitized VCR radio recording from May 1 1986. You can hear some interesting news tidbits on the soviet cover-up of Chernobyl, the Challenger disaster and the launch of a new hurricane tracking satellite. If recording was more popular it would have been interesting to hear soviet radio during this time too. In addition to archiving IQ files, Thomas has been releasing a podcast of curated historical audio recordings from VCR tapes, as well as modern recordings that may be of interest over at shortwavearchive.com. We envision a future where one day these recordings could be automatically turned into text logs via advanced speech to text software, so they could easily be searched through. The Airspy team have recently been working on a preselector retrofit product for their HF+. The Airspy HF+ already has excellent dynamic range and sensitivity, but by adding a preselector they seek to improve performance enough to claim that the HF+ is as good as or even better than much more pricey SDRs like the Perseus by achieving dynamic range figures of more than 105 dBm. A preselector is a filter or bank of filters that attenuates out of band signals. This is useful as radios can desensitize if an unwanted signal comes in too strongly. For example, if you are tuned to the 20m band, but there is a very strong MW signal, the SNR of your desired 20m band signal might be reduced. Radios with a natural high dynamic range design like the Airspy HF+ are less affected by this problem, but for the strongest of signals use of a preselector can still help. The Airspy HF+ preselector needs to be soldered directly onto the HF+'s PCB, and once installed it automatically switches bands using GPIO expansion ports controlled automatically via tuning in SDR#, so no external switching is required. The expected pricing of the HF+ preselector is US$49, and it will be ready for sale in a few weeks. Airspy have also provided us with a block diagram schematic which we show below. Insertion loss appears to be mostly below 3 dB with fairly steep skirts especially on the lower side. The top three filters do an excellent job at blocking out the broadcast AM band. Below are some VNA plots that show the filter responses. The preselector comes in a small 3.2 x 1.7 cm sized PCB that is fully covered with a metal shielding can. To install it you need to carefully solder it onto the HF+ PCB. This can be a little tricky since the pads are so small, but if you're experienced with soldering it shouldn't be an issue. First you need to open the HF+ and remove R3 from the HF+ PCB, which is a zero ohm resistor. The preselector PCB can then be positioned and the two IN and OUT pads soldered in place. Then you'll also need to connect the power and 2x GPIO lines to the preselector using wires. Now you need to bridge the two shielding CANs with a thick bit of wire. We simply used two cuts of copper solder braid to do this. Finally is also recommended to update the HF+ firmware to the latest version and download the latest version of SDR#. Once soldered in place the preselector is ready to use, and the HF+ cover can be put back on. It is expected that the commercially sold versions of the preselector will come with detailed installation instructions. In the first photo below we removed the shield to see what was inside, and the second photo shows it installed on the HF+ PCB. Whilst the preselector is designed for the Airspy HF+, there's no reason why it couldn't also be retrofitted onto other SDRs, such as our RTL-SDR V3, for use in improving direct sampling mode performance. The V3 has spare GPIO ports that can be used to control the filter, and 5V for powering the filter could be tapped off the PCB as well. Currently we're considering making a breakout PCB for the filter than might aide with this. We did a quick test with the preselector connected to the RTL-SDR V3 running in direct sampling mode, and as expected performance is much better, especially above 5 MHz once the second filter kicks in. This is because the second, third and fourth filters all heavily attenuate the MW broadcast AM band, which is the main source of overload issues on HF. The following screenshots show how much the filter was able to reduce the signal strength of AM broadcast when the second 5.2 - 10 MHz filter was turned on. This reduction was enough to prevent overload on all the higher bands. For the HF+ we tested by injecting a strong signal into two HF+ SDRs, one with the filter installed and the other without. The HF+ with the filter was routinely able to withstand much higher signal powers without any signs of overload occurring, and no degradation due to insertion loss was observed. The screenshots below show an experiment with a weak desired signal injected at 14.2 MHz, and a strong unwanted signal being injected at 1.5 MHz. With the unwanted signal at 5 dBm, the filtered HF+ showed no signs of overload, whilst the unfiltered HF+ had the AGC kick in to increase the front end attenuation, reducing the signal strength by about 20 dB and raising the noise floor. Other reviewers have also received the preselector and have been testing it. Fenu radio has uploaded a short review, and plans to write more in the future. He's also made his HF+ with preselector available for public use via SpyServer (details in his post). In the video below Leif SM5BSZ reviews the preselector and runs through several tests while comparing it against the Perseus. His results seem to show that the Persues gets a +25 dBm IP3, whilst the HF+ with the latest firmware and preselector is able to obtain a respectable +10 dBm IP3. For most people, the dynamic range of the HF+ is probably already more than enough, but if you are receiving very strong signals, the preselector can help get you get more performance out of the HF+. Of course the preselector cannot help if you have strong signals within the filter bands. If you're looking to get the most out of your HF+ then the filter at only $49 is a pretty good deal. Just take note that you'll need to open the HF+ and be comfortable with soldering onto the PCB.